Beloved Spouse went to the store last night and bought me a bag of Pretzel M&Ms! Cue "Love Is a Many-Splendored Thing." Here, I'll do it for you. Disclaimer: We walked the dog to the corner drugstore so I could get a Coke Zero. I waited outside with the hound while BelSpouse and Precocious Daughter went inside. 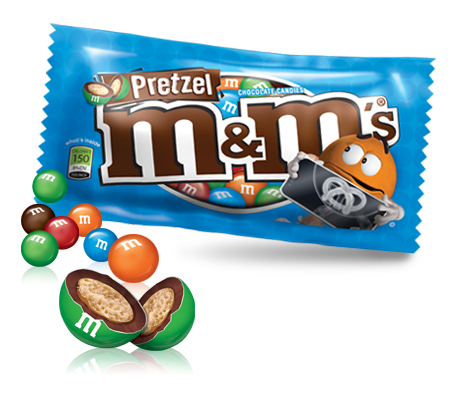 PDaughter actually picked out the Pretzel M&Ms, which BelSpouse said he would never have bought for me because he thinks they're gross. But - and this is the important part - he swiped the debit card. And then he handed them to me and told me they were gross. I'm calling it a complete victory for unconditional love. Next week: Tune in as I ask BelSpouse to buy me some tampons. Here are the links to the previous chapters in this stirring saga: "Chocolate Division" and "Chocolate Postscript." It's a trilogy, like the three good Star Wars movies, or the three bad ones!